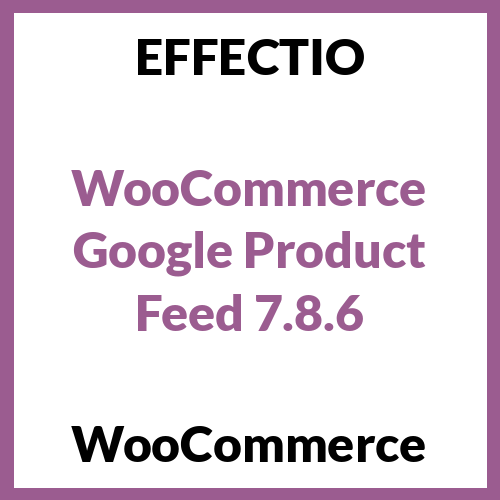 WooCommerce Google Product Feed lets you to create a real-time feed to supply product information to Google Merchant Center, a prerequisite for Product Ads. Choose what fields to include, based on Google policies. As an end result, you get a fully automated feed containing all your product information and variations. In addition, Google can read straight in because of the correct format. Capture data required by Google by using the plugin’s additional data entry fields for products and variations. Set up information at a category level to apply to products in a specific category. At the same time you can set storewide defaults that apply to all products. * More accurate image support. Fixes issues where non-attached product gallery images weren’t included. * Make sure non-printable UTF characters are removed in product titles as well as descriptions. * Avoid issue where product titles occasionally get generated with a “()”” suffix. * Clean up product URLs for attributes with no values set (E.g. “all colours”). * Allow multiple GTINs to be entered against products. * Avoid warning generated when saving a product after editing variations. * Product type taxonomy autocompletion now pulls relevant language version based on store base country, not always American (en-US). * Support for “material” in feed. * Allow delivery label field to be prepopulated from other product fields. * Extend the list of countries whose feeds should be supplied exclusive of taxes. * Add sale price effective dates to the Google Inventory feed. * Support for sale price effective dates. * Change to the base URL indicated in the feed. * Provides support for Product Inventory feeds for Google Merchant Centre. * Provides support for populating feed information product attributes without having to use code snippets. * Item GUIDs are now filterable via woocommerce_gpf_feed_item_ filters. * Fix Bing link in admin area to satisfy URL suffix validation. * Admin markup and accessibility fixes. * woocommerce_gpf_exclude_product filter can be used to include products that would normally be excluded. * Support for delivery_label attribute. * Revert previous variation pricing change since it causes feed disapproval in some cases. * Always use the maximum price for variable products in line with Google’s guidelines.